Search Engine Optimization is very important for any blogger. 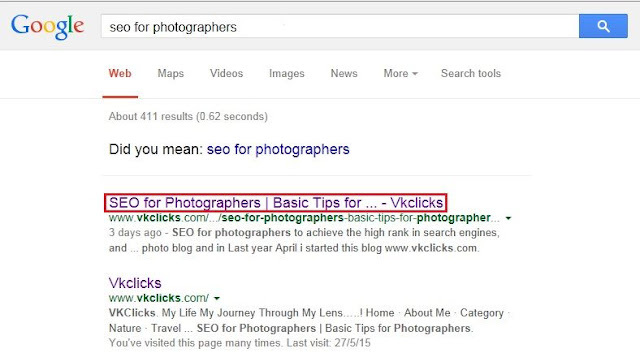 Today we are looking the basics SEO for photographers ,the Page Title Optimization is one of them, which will help you to rank your page well in search engine. For Photographers it is very important to have a title to their web page which displays their particular photo. Title is nothing but the Page title. For SEO it is very important to have a good keyword rich content optimized page title. 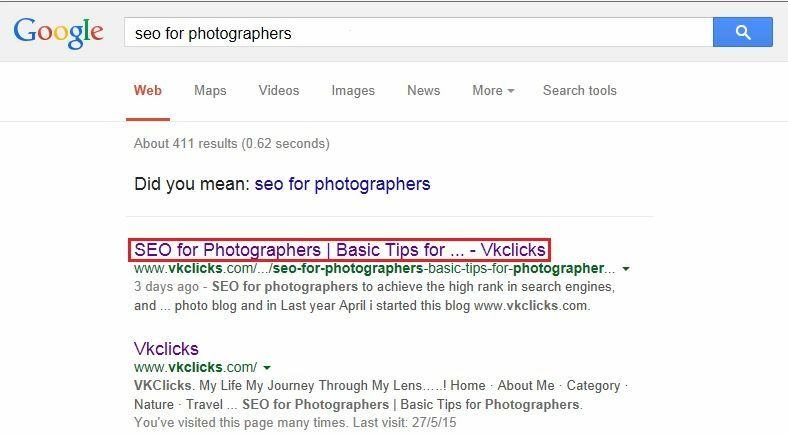 Page title is the snippet code that appears after searching the targeted keyword, As shown below I have searched the keyword “ SEO for photographers” and below is the result with page title of my web page. Page Titles are also part of what makes folks to decide whether to click on that page or not when it shows up in the search results. That's the reason page title optimization is very important. Unique and interesting page title for your webpage will attract more traffic. The keywords used in a page title are also plays an important role as these keywords are the key factors for search engines to understand the content of your page. As per the SEO You can use maximum of 70 characters, including spaces to your page title as Google will truncate the characters of your page title which are more than 70. It is best practice to place your keyword at beginning of title tags, reason for this if the keywords at the beginning then there might be chances Search engines may more readily return title tags. Keywords placed at the beginning of the page title may grab the users attention easily who are searching for the particular keyword. If your title catchy enough, then there is chances of attract more web traffic on your Photo-Blog. Page title must be unique, it is very important to have a unique title for every web page on your blog for good SEO. Duplicate page title may harm your SEO, means downgrade your ranking on Search engines. There is no point if you Page title is not related to your page content. Users may click on your site to get more information about that keyword which they are in search for. Thus make sure your page titles relevant to your page content. Use pipes | to separate your important (keyword) phrases to look page title clean in search engines. It will also easy to user to find your keywords easily. Don’t use commas, underscores, dashes or any other punctuation to separate your keyword phrase. By using above page title optimization tips you can achieve some good results.